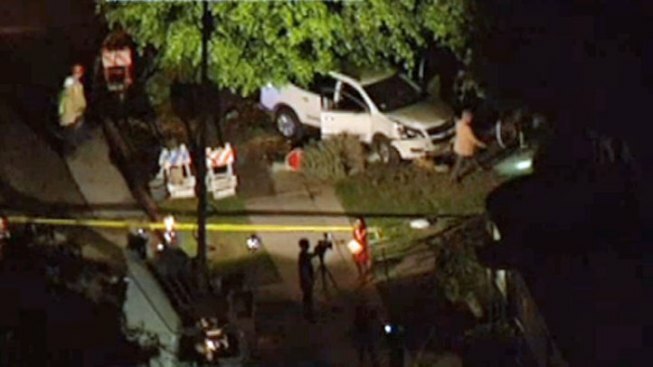 A car crashed into a power pole and fire hydrant in Valley Village, killing two and injuring six. The driver has been ordered to stand trial. Families of two good Samaritans who were electrocuted when they tried to rescue a driver who crashed into a power pole and a fire hydrant have filed wrongful death lawsuits, blaming the city’s utility for creating "a concealed trap" that led to their deaths. The families of Irma Yolanda Zamora and Stacey Lee Schreiber filed the civil lawsuits in Los Angeles Superior Court in May. Zamora and Schreiber were killed Aug. 22, 2012 when they tried to rescue Arman Samsonian who was trapped in his SUV that hit a light pole and sheared a fire hydrant in the 12000 block of West Magnolia Boulevard in Valley Village. Zamora and Schreiber were electrocuted when they stepped into a pool of water that had come into contact with exposed wires electrified by 4,800 volts. Family and friends held a funeral service for a local woman who died while coming to the aid of someone involved in a car crash. Among those named in the lawsuits are the city and county of LA, the Los Angeles Department of Water and Power, and Samsonian. Samsonian was arrested in the case and this week pleaded not guilty to charges of felony vehicular manslaughter with gross negligence. Lawyers for the families did not return calls seeking comment. A call to the DWP was not returned. A spokesman for the LA City Attorney's Office said he wouldn't comment on pending litigation.